I’ll be heading back to New York tomorrow so this is my last day in England for a while, though I will probably be back next year to finish up some family business. 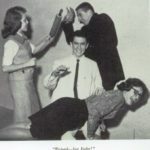 This week I am going to post a superlative from my small collection of superlative spanking photos. There are a ton out there, I just need to find them. This particular one is a classic in the true sense of the word, a mean looking 1950’s teacher, and a naughty girl with her hands on her knees ready for her paddling. That smile isn’t going to stay on her face for long!! This will be added to my WINDSOR’S PADDLING’S spanking album.